Does the color of your roof look severely weathered, faded or patchy? Or are you just fed up with your old roof color and looking to add a new coat of paint for your roof? Whatever it is that you require professional roof painting Sydney services are just a call away. And that is exactly what we specialize in. It adds to the aesthetic value of your home. It protects your roof from harsh climatic conditions. A well-painted roof prevents the growth of moldy organisms like algae and lichens. And lastly, it has been found to increase the value of your property. Extreme weather conditions and aging can affect the lifespan of your roof. If you neglect your roof until it is so deteriorated, you may have to replace it. But why worry…when we are here to restore the faded charm of your roof. Before we start painting on any type of roof we make sure that it goes through a few processes. We inspect the roof and make sure there are no loose or broken tiles. If there are any loose tiles we ensure proper joining to protect from dislodging and leaking. We high pressure clean the roof to remove dirt, grime, and mold. With more than 20 years of experience, we offer all types of affordable roof painting Sydney services. We have a team of certified painting specialists that cater to every type of roof tile – be it Terracotta, Concrete or Colorbond. As terracotta tiles are made from clay, a naturally moist material, moss, and lichen get attracted quickly not only restricting the flow of rainwater but also robbing off its sheen. 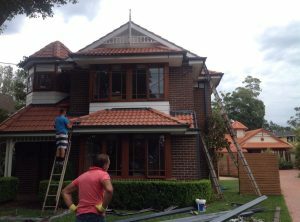 We have skilled roofers to carry out Terracotta Roof Tile Painting who only use high-quality paint to ensure long life and protection against the damaging effects of the harsh Australian sun and other natural elements in the environment. Concrete roof tiles are extremely durable and are designed to withstand severe weather conditions. But being highly porous, concrete tiles need a coat of paint to make it the best looking roof on your street. Our technicians are trained to identify the best paint for your Concrete Roof Tile and restore the faults before costly replacement is required. Colorbond Roofs hold steady in high winds and rainwater slide right off. However, colorbond roofing may need a fresh coat of paint after a few years. Our Colorbond Roof Painting service is a cost-effective way to revitalize the old and weathered appearance of your Colorbond Roof. Looking to add the lost color to your roof? If you are interested in knowing more about our roof painting Sydney services, call us at 1300 337 796 or 0405 229 765 or click here to request a free roof consultation. Our representative will organize a free roof inspection and give you a quote.